This just in: Not everyone is happy with the current state of the American economy. For the sake of argument, let's just put that number of economically dissatisfied Americans at, oh, 99 percent. While the majority of that majority has little recourse when it comes to affecting economic change beyond the occasional occupation of public spaces or the far more occasional Facebook meme, a select few outraged citizens are endeavoring to make a real, tangible difference in the monetary standing of everyday folks. For example, Montpelier's Michael Taub and Gwendolyn Hallsmith. Hallsmith and Taub are cofounders of a small nonprofit group called Vermonters for a New Economy, an organization that seeks to develop and promote more equitable, creative and sustainable economic models on a hyperlocal level. More germane to our purposes, they are also an amateur folk duo who bill themselves as the New Economistas. 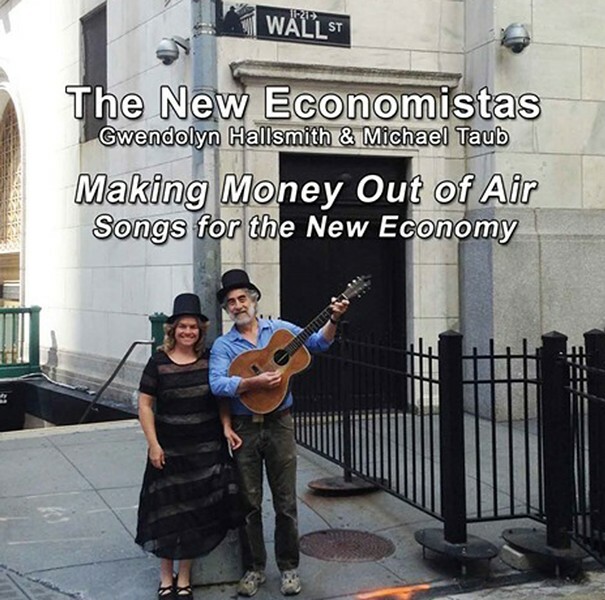 This week, Hallsmith and Taub release their debut record, Making Money Out of Air: Songs for a New Economy. In crafting the album, Hallsmith and Taub followed a time-honored folk tradition of adopting melodies that exist in the public domain and fitting them with new lyrics — in this case, typically ones of an economic bent. Undoubtedly, the New Economistas' chosen subject matter is a tad dry, which ups the degree of difficulty. But there's a folksy charm in their reimagining of American folk standards that makes the novelty, well, novel. For example, the opening cut, "Aldrich Cannonball," is a pastiche of the folk staple "Wabash Cannonball." The New Economistas' version plays on the original's locomotive theme with the story of how, in 1910, a group of Manhattan bankers and politicians took a private train car owned by Senator Nelson Wilmarth Aldrich to Jekyll Island. There they convened a secret meeting that led to the creation of the Federal Reserve. The album's eight remaining tracks generally follow the same blueprint, with similarly entertaining and educational results. "Economic Words" is based on Blind Blake's "Diddie Wa Diddie" but replaces that tune's not terribly subtle sexual references with a handy explanation of financial terms. "Ace in the Hole" updates James Dempsey and George Mitchell's 1909 classic as a cautionary tale warning of the role of money in politics. While much of the record has a lighthearted air, there are also serious underpinnings and sharp social commentaries. "Send the Banks" uses George M. Cohan's "Over There" to outline the ways in which economic warfare has come to replace physical violence as a means of destruction. "The Wealthy White Man" flips the script on minstrel songs, presenting a different sort of nefarious stereotype. The New Economistas celebrate the release of Making Money Out of Air: Songs for a New Economy with a show at Bagitos Bagel and Burrito Café in Montpelier this Saturday, October 17. The album is available online via SoundCloud.